Charité University chief executive officer Professor Karl Einhaupl has apologized for the role his predecessors played in experimenting on the remains of the victims of the Nama and Herero genocide of 1904 to 1908. Speaking during the handing over of the 21 skulls and three human skeletons of Namibians who had perished in the genocide, he said although the past cannot be undone, the least they can do is acknowledge the wrongdoing of their predecessors, and strive to learn from that. Einhaupl said they will ensure that the future generation of scientists and physicians are accurately aware of the responsibilities they bear, both towards their patients and society at large. “For this reason, this repatriation process aims to honour the victims, while simultaneously publicly denouncing the misguided crimes committed in the name of scientific progress,” he noted. Einhaupl said the handing over ceremony should also remind scientists all over the world that they must aspire to be guided by historically-informed, scientific investigations to foster scientific accountability and social responsibility in today’s medical world. He thus expressed optimism that the ceremony will serve as an example to other institutions to hand back any human remains which might be in their collections. Addressing a packed lecture hall, the Minister of Youth, National Service, Sports and Culture Jerry Ekandjo echoed these sentiments, calling on universities and people in possession of human remains to come forth and hand them over. Germany’s Regional Director for Sub-Saharan Africa, Ambassador Egon Kochanke felt that Germany should become more aware that this dark chapter still affects Namibia and all her citizens, and that it remains relevant to them. Kochanke said the handing over of the skulls is an important milestone for the German Federal Government, in intensifying bilateral relations between the two countries. “We regard the repatriation of the victim remains to their homeland, whether they died naturally, as a result of war or at the hands of others, as an act which demands gravity and empathy,” the former German ambassador to Namibia said. Shortly before the official ceremony, members of German civil society and non-governmental organizations held a silent protest in solidarity with Namibia. The protesters, most of who are from the African Diaspora, carried placards reading ‘Apologize now’, and a banner displaying a skull saying “In memory of the Nama and Herero”. 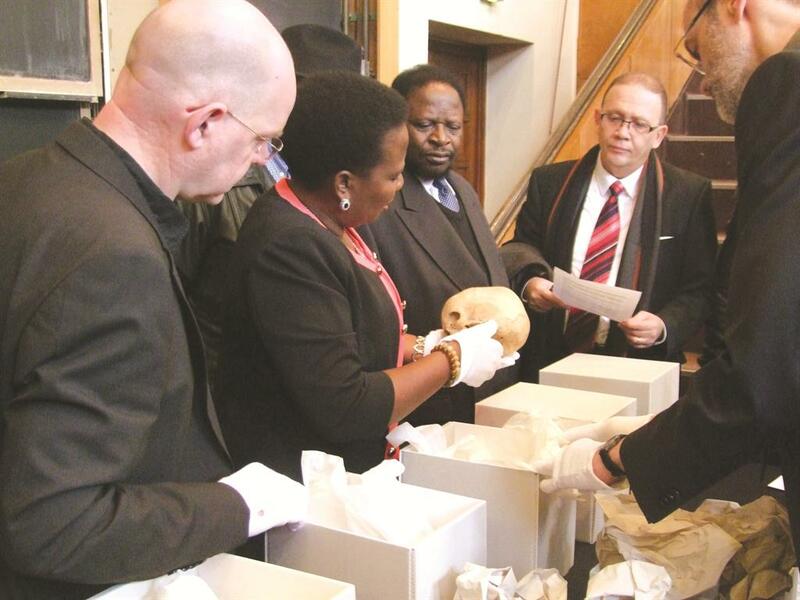 The second handing over ceremony has brought the total number of skulls returned to the Namibian delegation this week to 35, in addition to the three human skeletons. The skulls and human remains were expected in the country this morning with a ceremony to be held at the Parliament Gardens. President Hifikepunye Pohamba and other dignitaries are expected to attend.